Research shows that parental involvement in children's learning is a crucial factor in improving children's academic attainment and achievements, as well as their overall behavior and attendance. 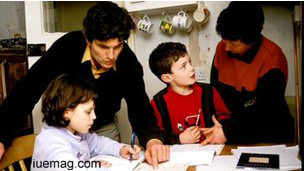 The right and duty of parents to give education is essential, since it is connected with the transmission of human life; it is original and primary with regard to the educational role of others, on account of the uniqueness of the loving relationship between parents and children; and it is irreplaceable and inalienable, and therefore incapable of being entirely delegated to others or usurped by others. By means of the reciprocal personal gift of self, proper and exclusive to them, husband and wife tend towards the communion of their beings in view of mutual personal perfection, to collaborate with God in the generation and education of new lives. The role of parents during a child's earliest years is the single biggest influence on their development. This is simply because, when a child is born, its brains contain nothing and therefore it's upon the parents to fill it with what they desire. Whatever word a parent tells a child, it has an outstanding impact on its wellbeing and growth. Basing on that note, I will urge all of us who are parents to be cautious on what we tell our young ones. Let us speak success in their lives, excellence in their works, and greatness in their being. Parents should regard as their proper mission the task of transmitting human life and educating those to whom it has been transmitted. They should realize that they are thereby cooperators with the love of God- the Creator, and are, so to speak, the interpreters of that love. Children should be so educated that as adults they can follow their vocation, including a religious one, with a mature sense of responsibility and can choose their state of life; if they marry, they can thereby establish their family in favorable moral, social and economic conditions. Parents or guardians should by prudent advice, provide guidance to their young with respect to founding a family and the young ought to listen gladly. At the same time no pressure, direct or indirect, should be put on the young to make them enter marriage or choose a specific partner. In addition to these characteristics, it cannot be forgotten that the most basic element, so Basic that it qualifies the educational role of parents, is parental love, which finds Fulfillment in the task of education as it completes and perfects its service of life; as well as being a source, the parent's love is also the animating principle and therefore the norm of inspiring and guiding all concrete educational activity, enriching it with the values of kindness, constancy, goodness, service, disinterestedness and self-sacrifice that are the most precious fruits of love. Of its nature, perfect married life means also the complete self-sacrifice of the parents on behalf of their children, and love of husband and wife in its strength and tenderness is an essential need for the most earnest care of the child and the guarantee that this care will be taken. It is therefore the duty of parents to create a family atmosphere inspired by love and devotion to God and their fellow-men. As it is the parents who have given life to their children, on them lays the gravest obligation of educating their family. They must therefore be recognized as being primarily and principally responsible for their education. The role of the parents in education is of such importance that it is almost impossible to provide an adequate substitute. The fecundity of conjugal love cannot be reduced solely to the procreation of children, but must extend to their moral education and their spiritual formation. "The role of parents in education is of such importance that it is almost impossible to provide an adequate substitute." The right and duty of parents to educate their children are primordial and inalienable. Parents must regard their children as children of God and respect them as human persons. Showing themselves obedient to the will of the Father in heaven, they educate their children to fulfill God's law. Parents have the first responsibility for the education of their children. They bear witness to this responsibility first by creating a home where tenderness, forgiveness, respect, fidelity, and disinterested service are the rule. The home is well suited for education in the virtues. This requires an apprenticeship in self-denial, sound judgment, and self-mastery the preconditions of all true freedom. Parents should teach their children to subordinate the "material and instinctual dimensions to interior and spiritual ones." Parents have a grave responsibility to give good example to their children. By knowing how to acknowledge their own failings to their children, parents will be better able to guide and correct them: He who loves his son will not spare the rod....He who disciplines his son will profit him. Fathers, do not provoke your children to anger, but bring them up in the discipline and instruction of the Lord. Through the grace of the sacrament of marriage, parents receive the responsibility and privilege of evangelizing their children. A wholesome family life can foster interior dispositions that are a genuine preparation for a living faith and remain a support for it throughout one's life. Parents are well aware that living conjugal chastity themselves is the most valid premise for educating their children in chaste love and in holiness of life. Education is the parents' domain insofar as their educational task continues the generation of life; moreover, it is an offering of their humanity to their children to which they are solemnly bound in the very moment of celebrating their marriage. Parents should be capable of giving their children, when necessary, a positive and serene explanation of the solid points of Christian morality such as, for example, the indissolubility of marriage and the relationship between love and procreation, as well as the immorality of premarital relations, abortion, contraception and masturbation. It should be stressed that the education of children is a sacred duty and a shared task of the parents, both father and mother: it requires warmth, closeness, dialogue and example. Any facts, figures or references stated here are made by the author & don't reflect the endorsement of iU at all times unless otherwise drafted by official staff at iU. This article was first published here on 14th February 2014.